Learning to drive isn't exactly the most stress-free experience you'll go through and for me, I found it rather stressful finding a driving instructor who I felt comfortable with. So today I thought it would be rather lovely to share my driving experience with you guys and celebrate passing my driving test! I started driving around 4th April 2015 after purchasing my first car on the 4th January 2015. I knew exactly what driving instructor I was going to go with as in my final year of school we had the opportunity to go on a driving day with instructors and have a 30 minute experience of driving for the first time. I had driven before this but only in one of our racing cars with my brother sat next to me. I weren't on a road with people around me. After having the 30 minutes driving experience with an instructor called Alan, I knew I would learn to drive with him when I was old enough too and also when I felt ready. I had around two months of lessons with him; one lesson a week for 1 hour each time. A total of around 8 or 9 lessons. Unfortunately, after spending more than 30 minutes with Alan, I found him quite rude and grumpy which made me feel extremely uncomfortable when driving as if I made a tiny mistake, he shouted at me. I decided to change driving instructors and went to learn with BSM. I also passed my theory test on the 15th April first time, this was a surreal feeling! I paid for a block of driving lessons for 10 hours and was given a driving instructor called Steve. He seemed very lovely when I spoke to him on the phone and I was looking forward to learning with him. On my first lesson He drove me to the next road from mine and we sat at the side of the road for an hour and a half. This was an introductory lesson to find out whether we could get along, absolutely ridiculous. I was extremely angry when I paid for this lesson to just sit there. After a few lessons with Steve I was still really unhappy with who I was learning to drive with. Steve didn't teach me anything and when he attempted to teach my bay park, instead of actually giving it ago, we sat in a parking space and he showed me diagrams so I would understand. After this lesson, I called BSM and asked for a refund of the lessons I hadn't used and went on the hunt for a new driving instructor. By this time, my car was finally on the road, taxed and insured and I was ready to drive with my mum. This was around May time. I was so nervous getting into my own car and not having an instructor with me but my mum being there did bring me comfort. I hated driving so much after driving with two instructors, I refused to drive in my own car and my mum would have to force me to drive otherwise I weren't going to get anywhere with my progression. After a few lessons with my mum, I drove myself to the hospital with her and stalled my car around 15 times just at two sets of traffic lights. I really struggled finding my biting point and pulling off using my handbrake. This experience was so frustrating and upsetting, I had cars beeping at me and then some were driving round me at traffic lights because I couldn't move. After this day, it took me a while to get back into my own car because I felt so unhappy. My first driving instructor gave me details of one of his friends who has a Peugoet as his learning car which was best suited to me as I also have my own Peugoet, although they were completely different because of the year they were made. To begin with, I felt a lot more comfortable with my new driving instructor, his name was Eric. He made me feel a lot more calm when driving and actually taught my how to do each manoeuvre correctly but with ease. I remember he asked me to parallel park and when I tried it using Alan's technique he questioned what I was doing because it was completely wrong. So he retaught it to me but in such an easier way to remember. I now bay park outside my house every day with no issues. After having a lot more confidence driving with Eric, I started to drive my car again and went back to the place where I constantly stalled to conquer the traffic lights, and I was able too! I had recently had my clutch replaced so I finally was able to pull away with no issues. I booked my driving test for the 8th September I think it was and towards this time Eric had changed his attitude with me completely and I found him uncomfortable to be around also. I dreaded having driving lessons for an hour because it made me feel unhappy still but I was hoping to pass my test in September so I didn't have long left with him. Unfortunately, I failed my first driving test in September for a completely unfair reason and I was so upset, I went home to my dad and brother and cried. I also had a job trial straight afterwards which didn't make me feel any better. Failing my driving test was a horrible experience, it completely knocked my confidence in driving and I stopped driving for a while. I also didn't have any more driving lessons after my first test because Eric believe I didn't need them any more, and driving in my own car was enough for me to pass my next test. I rebooked my driving test for the 17th of January I think! or maybe the 27th, and I also failed this one after having to rebook it for two days later as my examiner had just been in a crash and wouldn't go through with my test. I made a complaint to the DVLA because it was completely unnecessary and when they sent me the report back, what my examiner had wrote down was completely different to what he told me when I failed so I was furious. I had no confidence what so ever to be able to pass my next test as I had no hope. I knew if they could fail you for no reason and lie about it then there was no way I was going to pass at all. I started to love driving however when we came into 2016 and I drove all the time. If my mum wanted to go anywhere then I would drive so she didn't have to and it was great! I drove to Southend quite often which is around 50 miles from me and I absolutely loved it. My boyfriend started complaining about me not passing my test and he pushed me to rebook it. So I booked it for two months time which he was annoyed about but quite happy too, as I had booked it but for ages away. I knew my learner insurance needed renewing in May so I booked it for this time. It got to around two weeks before my driving test and I started panicking because Eric hadn't called me back and I weren't sure what was going on. At the time, I also couldn't do it in my own car as I had a couple of missing bits off it and a smashed head light cover which they would refuse. A week before my test I finally decided to do my test in my own car and have my mum come with me. I found a guy who was scrapping a car identical to mine so I bought all the bits I needed off his car and made mine look brand new again. I was incredibly happy, but I was still worried I would fail my test. At this point, I still hadn't told my boyfriend the day of my test which made me feel nervous too. 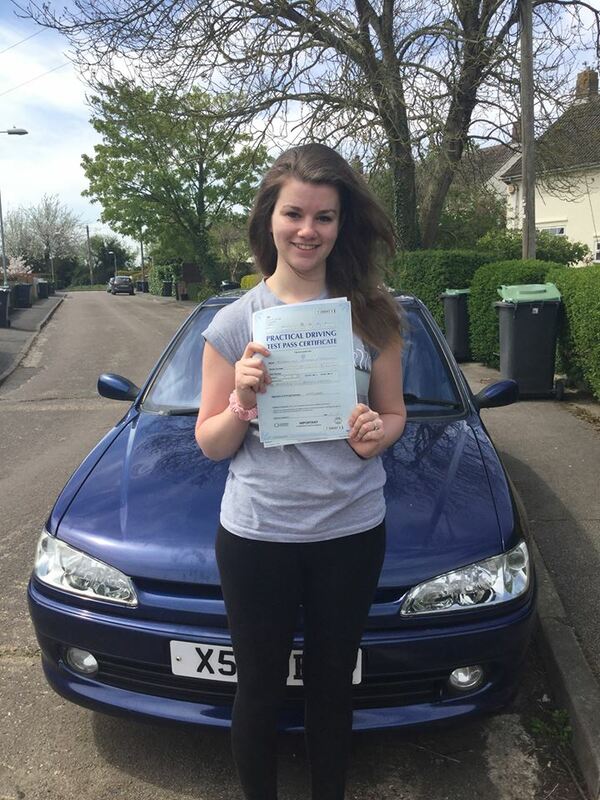 My driving test was Friday 6th May at 10:14am, the perfect time as my previous tests were both at 8:20am. I cried around an hour before I had to leave because I was so nervous and I knew I was going to fail. I drove to town with my mum and drove around for an hour before my test and cried again with her in the car. My nerves were overtaking my emotions and I felt so sick, I didn't want to go through with my test. I then bay parked outside the test centre. it was 10:12am and I cried again when I turned my engine off, I also then didn't have time to change my shoes as my trainers were too slippery! I walked into the test centre and a man named Paul called my name as soon as I stepped in. I started panicking because I couldn't change my shoes but he let me which I was so thankful for. He also let my mum sit in the back of the car during my test and said "shut up, don't say anything and no sudden movements" which made me feel at ease. 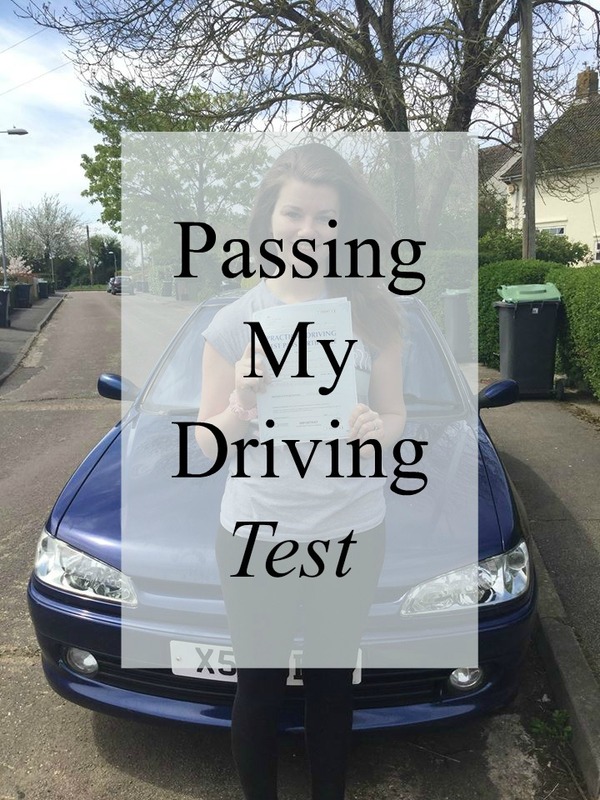 My test went completely fine, I was given the bay park to do in the test centre half way through which I was very confident about and then I carried on and drove on roads which I drove on weekly with my mum. A couple of times I saw my mum's expression in my mirror which scared me a little because I know I made a couple of mistakes but I carried on smiling. My driving examiner was so lovely and we spoke about what I would have been doing that day if I weren't on my test, and how the weather was so lovely. My previous two examiners were grumpy and didn't want to talk. I pulled up outside the test centre and Paul told me I passed, I honestly couldn't believe it. He gave my my test certificate and said I had only two minors which I was so happy with! He said he could tell I had been driving a while and it was a well deserved pass. The first thing I did was call my boyfriend while he was working and told him and all he could say was "really?" he was so confused! I didn't find driving difficult but my nerves definitely made me feel defeated most of the time which affected the way I drove. Sometimes driving with professional instructors isn't always the best thing to do either. I drove with my mum for more than half of the year I had been driving and she taught me so much more than what my driving instructors ever did. She was my rock through the whole experience and I couldn't have done it without her. I am now insured with Carrot Insurance and I can keep track of my driving using the telematics app which gives me a score each time I drive. This makes me feel a lot more confident when driving at a score 10.00 on every drive. I knew I could pass my test, but my nerves made me think different. If you're learning to drive, please do not give up. On so many occasions I wanted to stop driving, sell my car and never drive again but I didn't want to feel defeated, and my boyfriend would have been disappointed. You can do it, trust me! Let me know how your driving experience was when learning. What were the pros and cons of learning with an instructor for you? You have a nice blog. I read all of your post.